Every little girl dreams of becoming a Princess someday. My daughter was so blessed, hers was granted on her 7th birthday. 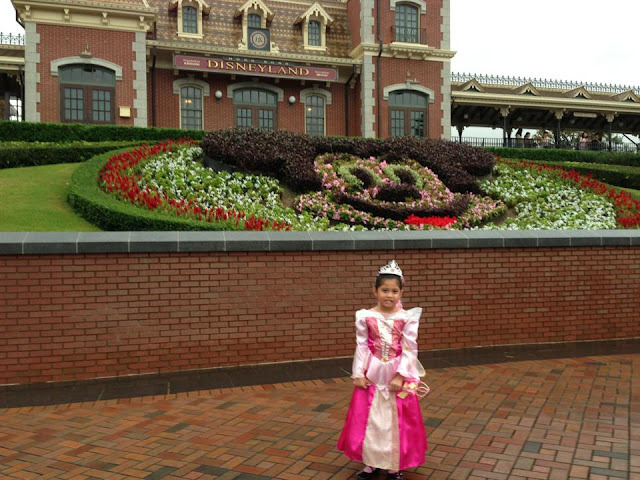 We recently celebrated her birthday at Hong Kong Disneyland and the experience was truly more than magical. Even I, was overwhelmed and elated with this unforgettable event in my daughter's life. 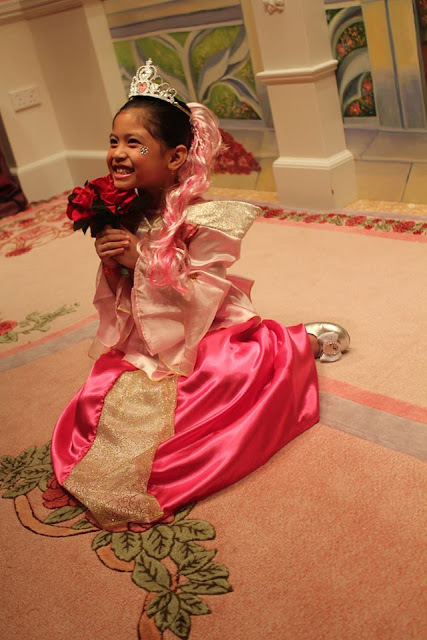 Hong Kong Disneyland Hotel was a wonderful host to such a memorable occasion. We couldn't have chosen any other place. In our room, we were greeted with this birthday cake towel complete with a birthday card signed by no less than Mickey Mouse himself. What a lovely welcome indeed! Upon our arrival at Hong Kong Disneyland Hotel, we went straight to the Bibbidi Bobbidi Boutique for the Little Princess make over. Sofie opted to become like Princess Aurora of Sleeping Beauty since she's her favourite Disney Princess character. I reserved the Castle Package which includes everything that's needed - from the gown, make-up, hair styling, accessories and the works. All that's included, was ours to bring home. They were all nice souvenirs to keep. The staffs (aka the Fairy Godmothers-in training) were very accommodating and efficient in their task. It didn't take too long for our little girl to have the look she wanted. After the make over, she had the Princess pictorial. We all had fun watching her enjoying the realization of her wish. The magical moments captured by the lenses were compiled into an exclusive Disneyland album. We had the option to choose which photos we want to be included. It's definitely, another memento worth keeping. One of the highlights of the birthday celebration was the meet and greet with the Disney Princess Characters at the theme park. Sofie's smile shows how delightful she was to mingle with them sans the long queue. She got an express pass to meet all the sweet, lovely ladies. At the Enchanted Garden restaurant, we had the birthday dinner with the much loved Disney mascots. It was another wish came true when Minnie Mouse delivered the birthday cake and lead the singing of the Happy Birthday Song. On the other hand, Mickey Mouse made sure that he also had a birthday surprise for the celebrant. He gracefully ushered the little Princess to a magical dance which we really adored. There was also a goodie bag that was filled with Disneyland keepsake and gifts. All in all, I am absolutely grateful that everything turned out so well as planned. Thank you Disneyland for all the wonderful memories! It was undoubtedly a celebration worth remembering; a family treasure that will last a life time. 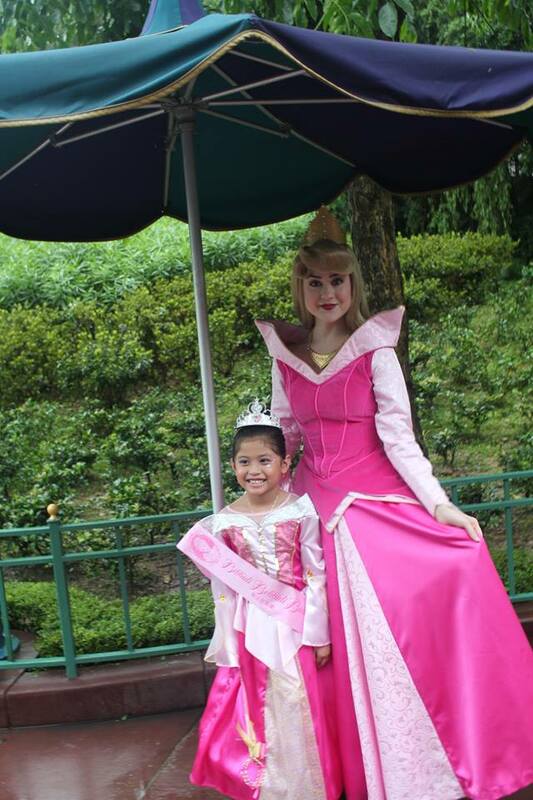 Hi,I'll be bringing my daughter to Disney HK to clebrate her birthday end of this month. May I know how did you arrange for the character appearance at Enchanted Garden Restaurant? Thank you in advance. The Character Mascots will be roaming around the restaurant during breakfast and dinner. If you have specific request, you can approach any staff in the restaurant and they will assist you. Hi Sherra, it would be really useful to readers of your blog, like me, if you could tell us how we can sign up for the 'express pass' to meet characters. Also, how did you inform the hotel about the birthday so that she got a card/towel cake? Hi, I just informed the hotel upon booking that my daughter will be celebrating her birthday in Disneyland, we didn't specifically ask for the card/towel cake but I guess it's automatic when they've learned that we're going there for my daughter's birthday. If you book a Bibidi Bobidi Botique package and your child will dress as a princess, she will have a special express pass when you lined up for the photo opp with the Disney princesses. Hello! I planned to do the same for my daughter, I wonder if your husband and son (I saw your family pic in the album) were able to join the Princess Party. Can my son & husband do so? Are they going to register too? Thank you so much! Hi I'm planning to bring my son to Hong Kong Disneyland to celebrate his birthday, i just would like to know how much is the cake for the celebrants? And did you avail a certain birthday package for your child? Hope to hear from you soon.. Thank you! pls. do share your experience with us. Did you have the same welcome like Mun Yee and the restaurant celebration. Yes, the whole family (including husband & siblings) can participate in the party & photo opp. I did a DIY package for this. Basically, just the boutique princess make over, then I arranged the cake & bday treat with the restaurant separately. You can inform they exactly what you want.